The Earth has an axial tilt of about 23.44° (23° 26’). The axis is tilted in the same direction throughout the solar year. However, as it orbits around the Sun, the Earth’s hemisphere that is tilted away from the Sun will gradually become tilted towards the Sun while moving on a near circular orbit, and vice versa for the other hemisphere. This effect is the main cause of the four seasons. The hemisphere that is tilted towards the Sun experiences more hours of sunlight each day. The Tropic of Capricorn, or southern tropic, is one of the five major belts or circles of latitude. It marks a region of homogenous temperature on the map of Earth. It lies 23° 26′ south of the Equator, and marks the most southerly latitude at which the Sun appears directly perpendicular on December 21 in an event that is called the Winter Solstice. Due to Earth slight wobbling around its axis, much like a top toy, the Winter Solstice is very slowly moving away from December 21. 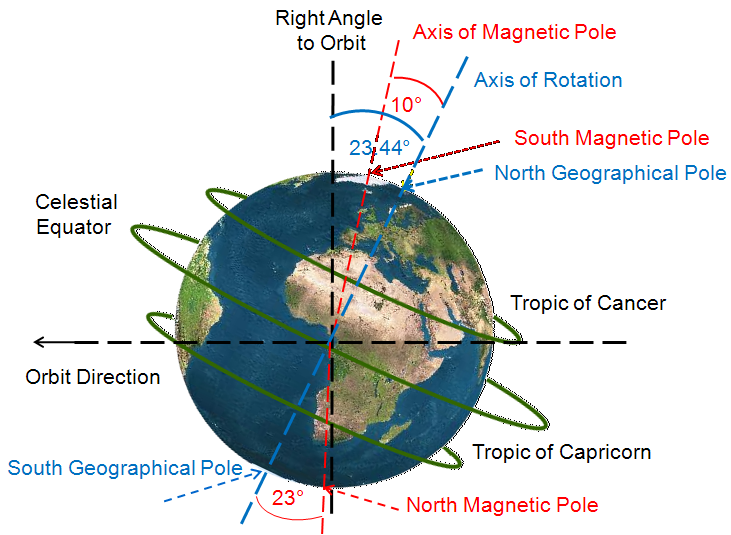 Equally, in the northern hemisphere, equivalent of the Tropic of Capricorn, there is the Tropic of Cancer at which the Sun appears directly perpendicular on June 21 in an event that is called Summer Solstice. The region north of the Tropic of Capricorn and south of the Tropic of Cancer is known as the Tropics. Therefore, it is the case that the Sun perpendicular appearance on the surface of the planet is confined and is in constant forward and backward movement in the Tropics region. Some believe that the Equator experiences the highest temperature since it is thought to be closer to the Sun than any other region of our planet. However, we should consider that the Earth axial tilt does not make the Equator any closer to the Sun than the southern Middle Latitude Belt during a Winter Solstice for example and at such a time the closest to the Sun would in fact be the region tangent of the orbit plateau of the solar system i.e. on the Tropic of Capricorn that is not as hot as the Equator. Some question what makes the Equator to become the hottest place on Earth when measured at sea level at all times? Some attribute the angle of projection between the solar rays and the surface of the Earth to influence the temperature variation. The angle of projection starts from 90° at the region tangent to the orbit plateau of the solar system and grows smaller until it reaches 0° at the region perpendicular to the orbit plateau of the solar system. This does not explain why the surface region that is located at 90° (degree) with respect to the solar energy, i.e. at the Tropic of Capricorn during a Winter Solstice, to have less temperature than at the Equator, where the temperature is currently highest while the angle of projection is less than 90°! Lying between the two tropics, and if the angle of projection and/ or proximity to the solar energy are the drivers of high temperature, the Equator could only have the chance, once every six months, to get situated at a right angle, closest to the Sun. This should not make of it the hottest place on Earth all year round; but it is! As shown in Figure 16, on a Winter Solstice day, when region y (Equator) is at the same distance and angle of projection from the Sun as region x (southern Middle Latitude Belt); why then, do they have a difference in temperature? And what does make region y (Equator) the hottest place on Earth all year round; while the nearest region to the Sun, region z (Tropic of Capricorn), experiences a lower temperature? You may eventually ask, what makes temperature difference across the surface of Earth altogether, when measured at sea level? 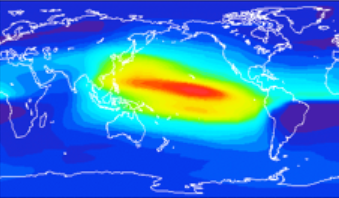 HE-S is the radiation intensity (in W/m2) at the Earth’s Troposphere due to radiation received from the Sun. D is the distance from the Sun to the Earth’s surface in meters. It is therefore found that the radiation intensity reaching the Earth from the Sun is 1,366 Watt/m2. HE-T is the radiation intensity (in W/m2) at the Earth’s Troposphere due to radiation received from the Thermosphere. T is the temperature of the mid distance between the two magnetic poles at the Thermosphere and is taken at average of the highest of 2,000o Kelvin and the lowest of 450o Kelvin i.e. 1,225o Kelvin. Sheat ellipsoid in thermosphere is the highest thermal radiation region of the Thermosphere that is modeled as an ellipsoid of radii equal to the weakest magnetic contour at 24 mTesla (400 km, 1650 km) and depth of 100 km (where most of the Sun’s charged protons get trapped), and is calculated as per following, S = 4 π [(ap bp + ap cp + bp cp)/3] 1/p ; where p=1.6075 and a= 400 km, b= 1,650 km, c= 100 km. Sheat ellipsoid reaching Earth surface is the reach of the thermal radiation area from the Thermosphere which is half of the surface area of Earth which equals to ½ πr2; where r is the radius of Earth standing at 6,000 km. It is therefore found that the radiation intensity, which reaches Earth from the Thermosphere is 2,534 Watt/m2. This means that the thermal radiation reaching Earth’s surface from the Thermosphere is approximately 1.8 fold stronger than that reaching Earth from the Sun directly. The collision of oscillating Sun’s protons when spiraling between the two magnetic poles, day and night, keeps the Thermosphere thermal radiation uninterrupted, though decaying at night. Such a phenomenon keeps Earth surface temperature safe from sharp drop at nights when the day on Earth gets longer. As the Sun ejects mass-energy of heavy particles such as electrons and protons, the magnetic field at the Thermosphere layer shields such energetic bodies. The trapped protons, full of kinetic energy, have no place to go but to spiral along the magnetic field lines while they are travelling between the two magnetic poles. As protons encounter regions of stronger magnetic field where field lines, they converge at the magnetic pole, protons spiral-radius is shortened and their speed slowed down, before bouncing back in the direction of the other magnetic pole and possibly colliding with other protons on the path. Thermal radiation coming from such collisions gradually decay above the sky of a specific region of Earth’s surface for the rest of the day including after sunset. In summary, protons reach the minimum spiral-radius and speed at each of the magnetic poles, where the magnetic field intensity is highest. Collisions between such spiraling protons with one another at the Thermosphere at various speeds produce thermal energy and temperatures that are proportionate to the protons speed and spiral-radius motion. Temperature is found to reach 180° Celsius above the magnetic poles and to gradually escalate to reach to a maximum of 1,700° Celsius above the magnetic equator. This makes the region of magnetic equator to always maintain the highest temperature on the surface of the planet and for the regions of the magnetic poles to maintain the lowest temperature. The trapped, oscillating Sun’s protons between the two magnetic poles, day and night, keeps the Thermosphere thermal radiation uninterrupted, though decaying over nights. Such a phenomenon keeps Earth surface safe from sharp drop in temperature at nights. If it had not magnetic field to trap the protons, Earth’s surface would have been bombarded during the day with continuous flow protons and the day temperature would have not been different from the moon’s, which has no magnetic field and a day temperature of 123o Celsius. Equally at nights, if Earth had no magnetic field to trap the protons and keep them travelling between its two magnetic poles, colliding with one another and generating thermal radiation to keep a warm surface, Earth temperature at nights would have not been different from the moon nights, where the temperature reaches -233o Celsius. The collapse of Earth’s magnetic field in the western and southern hemispheres leads to an increase in the protons speed and spiral-radius motion around the magnetic force lines. More chances are created for the protons to collide with one another at a higher speed. The impact of stronger collisions at higher speeds, results in higher thermal energy reaching Earth’s surface; Global Warming is thus observed. It is imminent, therefore, that a change in the temperature pattern and precipitation map of the planet will follow any change or repositioning of the magnetic poles and the associated magnetic field intensity; causing Climate Ex-change; as some countries experience warmer than earlier average temperatures such as North America and others experience cooler than earlier average temperatures such as Siberia, in the past few winters. The combined effect of the weakening and the tilting of Earth’s magnetic field lower its intensity above the North Pole ice cap. The lower the intensity and number of the magnetic field force lines, the longer spiral-radius motion and the faster the speed will protons pick up. A higher thermal energy is generated upon such protons’ collision with one another in the Thermosphere layer. A similar model could be applied onto planet Mars, where at the same time the ice cap is melting on Earth, the ice cap is melting on Mars. The temperature at the Thermosphere layer of the Atmosphere ranges between +180o and +1,700o Celsius. Due to the movement of both magnetic poles to the east at the same time, the magnetic field intensity has weakened over the western hemisphere by an average of 10% between the years 1850 and 2000. And additional collapse of 5% in the following decade took place. The weaker the magnetic field, the longer spiral width the protons, arriving from the Sun, will travel around the magnetic field force lines, while oscillating between the two magnetic poles. The longer the protons travel, the more probability to collide with one another, and accordingly more radiation to emerge causing overall increase in global temperature. Also, the weaker the magnetic field the more chance for protons to pierce through and bombard the surface of Earth. Arriving at high kinetic energy into the ocean leads to ocean warming, and to release Methane gas that bonds with Oxygen to form Carbon Dioxide and Water Vapor; both are green house gases that lead to incarceration of energy into the Atmosphere and more increase in global warming. The Temperature Belts of homogenous climates follow the temperature map of the Thermosphere. The Polar Belt lies under the minimum temperature of the Thermosphere, and the Tropical Belt lies under the maximum temperature of the Thermosphere. Therefore, the closer to the magnetic pole, the colder it is and vice versa. As the magnetic pole moves away from Canada towards Siberia at a much higher rate than last century, the whole magnetic field tilts accordingly, and brings the Thermosphere temperature map to tilt along. This results in shifting of the Temperature Belts on the surface of Earth, causing Climate Exchange, where regions will experience change of Temperature following the Thermosphere temperature map. Given the manuscripts, which come from ancient texts that describe a bitter cold wave that occurred between the years 900 AD and 950 AD, in Arabia, we find an obvious climate zone similarity between current date Europe and ancient date Arabia in the years between 900 AD and 950 AD, as we centre the Temperature Belts around the location of the magnetic pole. This suggests an obvious indication that Temperature Belts follow the Thermosphere temperature which follows the magnetic field intensity, which is driven by the locations of the two magnetic poles. This proves that Global Warming and Climate Change are not completely anthropogenic. Um…Mars has *no* magnetic field. 2) Mars does not have all-round-the-planet aerial magnetic field that, on Earth, is the source of the aurora borealis and the antipodal aurora australis. According to the physicists, the auroras on Mars aren’t due to a planet-wide magnetic field, but instead, are associated with patches of strong magnetic field in the crust, primarily in the southern hemisphere http://sprg.ssl.berkeley.edu/~brain/press/marsaurora.html. What if the Martian magnetic field is more sedimental than aerial? It fluxes out of the planet at the magnetic poles only to re-emerge back through the geological layers from pole to pole. 3) I believe that Earth has a 3-magnet configuration as I explained on https://planet-earth-2017.com/the-true-source-of-earth-magnetic-field/ that is composed of A) two induced magnetic fields that are generated in the outer core. They are weak and appear in patches of south magnets in the southern and northern polar circles, and B) one permanent magnet; the inner core, that is strongly fluxing out of Antarctica, circling around the planet and is observed as the Earth-wide magnetic field. 4) I believe that Mars equally would have a 3-magnet configuration which is composed of A) a permanent magnet that is not strong enough to aerially circumvent the planet but rather flow through the geological sediments from pole to pole, and B) two induced magnetic fields of south magnetic polarity when observed on its surface at the poles’ locations. Such magnetic umbrellas at both poles stand as shields against the Sun charged particles and therefore leading to low temperature on surface for CO2 to freeze. 5) The approach to the inner solar system of Tyche http://www.nasa.gov/mission_pages/WISE/news/wise20110218.html which is not yet confirmed by NASA, results in pulling the Martian magnetic field force lines from their usual paths. As the magnetic umbrellas loses some of its force lines, more charged particles arriving from the sun manage to reach the poles’ regions at high kinetic energy. The heat generated out of the bombardment of such protons causes the frozen CO2 to start to melt. Suggesting that earth’s day and night temperature swings would be much more extreme and like the moon if the earth lacked a magnetic field would seem to neglect the very considerable green house effect of the earth’s atmosphere. Could you explain? I’d rather consider Mars to answer the question, since its climate has important similarities to Earth. It has polar ice caps, seasonal changes and noticeable presence of weather patterns. The atmosphere of Mars is roughly 100 times thinner than Earth’s, but it is still thick enough to support weather, clouds, and winds. The atmosphere height is 11 km (6.8 miles), versus 17 km ( 10.6 miles) of Troposphere’s height on Earth. The average temperature on Mars is −55 degree C (−67 degree F) and the surface temperatures may reach a low of about −153 degree C (−243 degree F) at the poles and a high of about 20 degree C (68 degree F) at noon at the Martian geographic equator. Its equator also happens to align with the Martian magnetic equator although the Martian magnetic field is very weak. When we apply the solar radiation formula as shown above in this very page, we find that while the heat that arrives from the Sun to Earth measures 1,366 watt/ m2, it measures 698 watt/m2 on Mars. It makes you wonder why the Martian average surface temperature is −55 degree C (−67 degree F) while the average surface temperature on Earth is +14.6 degree C (+58.3 degree F). In this page as detailed above, I explain that the temperature on the surface of Earth is not only influenced by the Sun’s radiation but also influenced by the Thermosphere’s radiation in a ratio of 1 to 2. Now, since CO2 forms 96% of the Martian atmosphere, one would expect that the Martian atmosphere would lock in much of the heat arriving from the Sun following the greenhouse effect principle! and that Mars would keep warm and get warmer. But it does not, does it? Therefore, I tend to believe that the greenhouse effect is irrelevant to the global warming studies. There remains one question to be answered: Why is there sharp day/ night swings of temperatures at the Martian surface? Well, the bombardment of Sun’s charged particles is shielded to a great extent by Earth’s strong magnetic field. However, a different case applies on Mars; due to the weakness of its magnetic field, the charged Protons find its way to hit the Martian surface during the day, causing the region facing the Sun to get warm, only for the Sun to set, then the warm region falls back to harsh coldness. Excellent information. But I still could not understand why temperature at tropic of capricorn is lower on 21 December compared to tropic of cancer on 21st June. 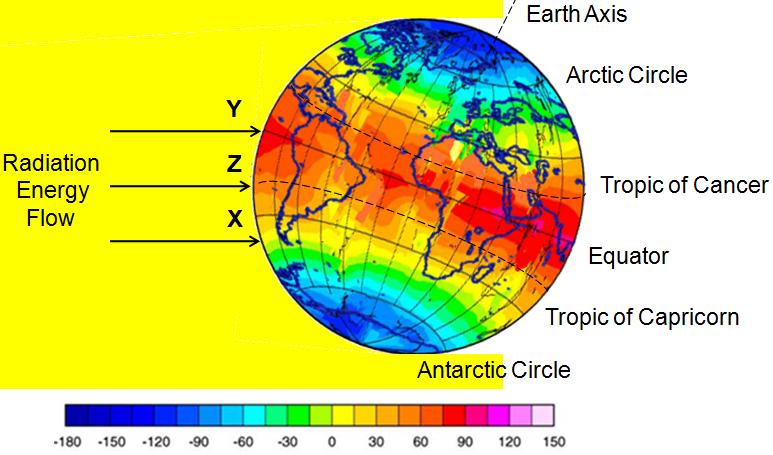 Several factors could influence the temperature map at the thermosphere layer and therefore related thermal radiation on the surface of Earth such as: Earth orbit around the Sun is not a perfect circle, the 2 magnetic poles are not aligned on the same axis from the axis of rotation (10 and 23 degrees shift in north and south geos), the amount of protons flow during the 11 year Sun cycle, Sun flares, Sun spots..etc On top the trade winds could very well add to the influence on the ground temperatures. Although the article is thoughtful, factual and well-written, the statement and conclusion that,”Thermosphere temperature which follows the intensity as well as the locations of the two magnetic poles and proves that Global Warming and Climate Change are not anthropogenic.” is not entirely correct. It is widely acknowledged that the world’s climate had fluctuated throughout the geological epochs; but it is certain that anthropogenic factors, at present, are also contributing to these climatic fluctuations. It is undeniable that the global temperature, at present, and as a whole, is currently increasing at an historically unprecedented rate, and not simply shifting from place-to-place. Certainly, the gradual weakening of the geomagnetic field is a significant factor; but the emissions from modern industrial civilization is also a significant contributing factor. What is unknown, is what both of these significant contributing factors will have on the naturally occurring climatic cycles, working in tandem. What we do know, is throughout the geological epochs, this world’s temperature and climate had fluctuated markedly from such extremes as a so-called ‘hothouse world’ to a so-called ‘snowball world’, and back again, several times, for extended periods of time. We also know that we are currently, technically, in an ice age, although in an inter-glacial period. We also know that whenever one of these significant climatic shifts occurs, it causes mass extinction events, on a worldwide basis; and it acts as a primary factor in forcing evolutionary events in many clades of life (including our own). We also know, that we humans (Homo sapiens sapiens), at present, are an ice-age adapted species. Will our agricultural and aquacultural systems be able to adapt to these changes quickly enough? Probably not. It is certain that anthropological degradation of the world’s biodiversity and ecosystems, that we all ultimately rely on, is not beneficial for the continuance of either the life-forms that we collectively wantonly destroy, or for ourselves. This is primarily due to one fact, that there simply are too many of us! Sadly, I’m afraid, that most humans will not be likely to survive through the next millennium, and the precursors to this are already clearly evident. We all need to smarten-up in a hurry, but this is unlikely to happen. Read on for the primary reason why…. They are not just impacting the atmosphere, or the geomagnetic field; they are also impacting our brains. This, along with other cosmic radiation, and electromagnetic energy of various wavelengths, from cosmological sources. This is causing ‘space brain’, a neurological degenerative disorder to develop in many people. As this world’s geomagnetic field progressively weakens, these conditions will become increasingly prevalent in many people, since the geomagnetic field had historically partially protected us from these harmful particles. Add to this, that we are well-overdue for a relatively nearby supernova or hypernova event from a collapsing super-massive star. I believe that this had already happened, and we are simply waiting for the electromagnetic effects from it, due to space-time relativity. It is also likely that there will be a series of such events, in the near future, in relatively quick succession. We do know that the protective geomagnetic field has been weakening gradually, and would reduce to zero in about five centuries, but that this rate of diminishment had accelerated over about the past decade. It is likely that this is a precursor of an overdue geomagnetic pole reversal event. Are these types of events, occurring simultaneously and in relatively quick succession, survivable? Certainly. Our distant ancestors, the australopithecines, had somehow survived similar events, and they did not have large brains. The difference is, that they were never around in large numbers, and that they were also fairly limited in their ranges. They also had a diversity of habitats to exploit, without industrial pollution to contend with. What is certain, is that most of us modern humans, will not survive. We simply will be unable to sustain large populations with severe cognitive impairment in most of the population. Any further growth in the human population is detrimental to the relatively few humans that might survive. More population growth, is no longer an option. 97% of the scientists believe that Global Warming and Climate Change are anthropogenic. In an effort to unearth such a position, I try to push the pendulum further to start a debate to reach an agreement. For only when the right cause is detected will the strategy to avoid further deterioration and/ or be prepared to minimize the casualty be probable. 2- Increase of Temperature overall as a result of an increased level of green house gases. On the page Change Cycle https://planet-earth-2017.com/the-hour?iframe=true&theme_preview=true of this site and by linking geological and historical events, I try to explain how long an interval between 2 successive changes to Earth Climate, Sea Level(s), Earth Spin Speed..and so on. Unfortunately the geological discoveries of an ice, arid, or tropical footprint in one isolated region was amplified by scientists as an evidence of global ice age/ scorching age driven by an assumption that the temperature belts have always assumed the same geographical location and that the only variant was the temperature scale within each belt. I am not sure if any scientist has paused and reflected for a second; what if the discovery of an ice footprint in a sediment in one location was not caused by a global drop of temperature, but rather by shifting of a magnetic pole and consequently the associated polar temperature belt to such location at a point in time in the past! I agree that the increase level of protons could very well harm humans. The increase of protons reaching the surface of the Earth results in increasing cases of depression and cancer risks, damage to central nervous system and cataracts as well as other diseases. The acute effect of a whole-body proton radiation on the function of leukocyte populations in the spleen and blood were examined in small mass animals. Adult female mice were exposed to a single dose (3 Gy , where Gy is Gray or unit of Radiation) of protons and were killed humanely at six different times thereafter. A typical schedule of treatment of human cancer via radiation for adults, for comparison, is 1.8 to 2 Gy per day, five days a week as I explain on a page of this site called Sky Phenomena https://planet-earth-2017.com/sky-phenomena?iframe=true&theme_preview=true More collapse of the magnetic field in the Americas, the rim of the South East Asia and the tip of the south of the African Continent could bring fatal consequences. I bring a total view on the origin of the magnetic field that is completely different than what is written in science and books. While there is an induced magnetic field, there is also a permanent and stronger one. The induced magnetic field produces the Plasmoids (regions of south magnetic polarity in Antarctica). The permanent magnetic field comes from the Inner Core, whose poles are currently moving eastwards. More on the page of this site titled Earth Magnets https://planet-earth-2017.com/the-true-source-of-earth-magnetic-field?iframe=true&theme_preview=true . As a non scientist I cannot comment on the theory of one permanent and one induced magnetic field but I have read V Zharkova’s theory in which her team computer generated a SECOND MAGNETIC FIELD IN SOL which seemed to resolve discrepancies in solar magnetic field reversals. So, could the induced field you propose for Earth be related? V Zharkova’s found magnetic wave components appearing in pairs, originating in two different layers in the Sun’s interior. They both have a frequency of approximately 11 years. This however does not justify the 2 Earth magnetic poles moving eastward consistently over the past 100 years https://planet-earth-2017.com/2014/08/15/the-true-drop-in-the-magnetic-field-strength/ Earlier on, and on my research of the Magnetic Configuration of the Earth, https://planet-earth-2017.com/the-true-source-of-earth-magnetic-field/ I manifest that applying the Coriolis Effect on electrons flowing in the Outer Core, one should expect an induced magnetic field of South Polarity when observed at the orthographic trajectory of the Outer Core at both Arctic and Antarctic regions and not a North and a South magnetic pole as is currently observed. In face such patches of induced South Magnetic polarity is detected in the Antarctic region where the North Magnetic Pole currently reside, and as researched by the Indian Institute of Geomagnetism, Colaba, Mumbai, such South Magnetic Polarity patches only started to appear some 10,000 years ago. Earth must have been spinning slower then, I added! I also explained that not only Earth has a “generator” (dynamo) thanks to its Inner Core radioactive behavior, but it also has a “motor” caused by the Lorentz Force that is produced by the interaction of flowing electrons and permanent magnetic field force lines on the perimeter of the Inner Mantel at the equatorial plane. 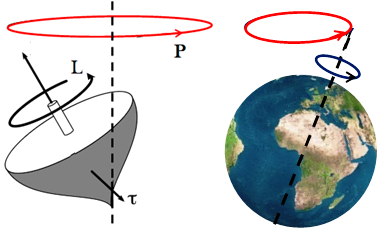 The angle of flowing electrons current is always fixed but the angle of the magnetic field force lines is variable as a result of the permanent magnet (Inner Core) ability to tilt, swivel or flip; causing the Lorentz Force to change causing different spin speed at different eras https://planet-earth-2017.com/what-makes-earth-spin/. The only problem we can affect is co2 intensity in the atmosphere so we should be more active in converting to the hydrogen economy with the necessary primary source of orbital motion of the moon moving the oceans and the sun for energy and I am willing to concede nuclear energy is needed during conversion. I for one would simply like to thank you for the considerable, and well considered science. This EU oriented thinking is clearly what will allow us to survive and thrive on this planet, if we can ever get beyond the chaos of capitalism. Fascinating reading for a Sunday morning. I will be following you closely and encouraging others to do so. What do you think of the proposed possibility of the poles shifting to the Bermuda Triangle and the location of the Sumatra Earthquake-Tsunami? I certainly accept that Mars and Venus along with, possibly, other bodies which may have changed locations within or passed through our solar system, have arched with the Earth as orbits have shifted and brought bodies into electrical interaction… But this whole Planet X thing seems ludicrous, a planet 4 times the size of Earth whose path in the solar system we can’t detect?!?.. Yet it will come close enough into electrical interaction with the Earth to push our poles that far off their current positions?!! Also, I wonder if you have thought about the radiation and energy effects recorded at the crop circles?